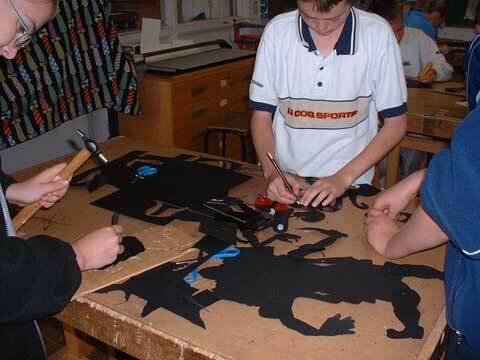 Black Cat Puppetry Workshops and Indian Marionette or Shadow Theatre Performances support and provide inspiration for many areas of the National Curriculum. Encouragement and guidance on speaking with clarity and confidence. Varying speech for different characters. Creating stories with meaning and form. Guidance in being a listening audience, reflecting on and directing the performance of classmates. Use of character, action and narrative to convey story, themes, emotions and ideas in plays they devise and script. Distinguishing different kinds of light and their effects on shadows. Observing that light cannot pass through some materials and how this leads to the formation of shadows. Learning how different materials block the light, create patterns, coloured shadows or reflections. 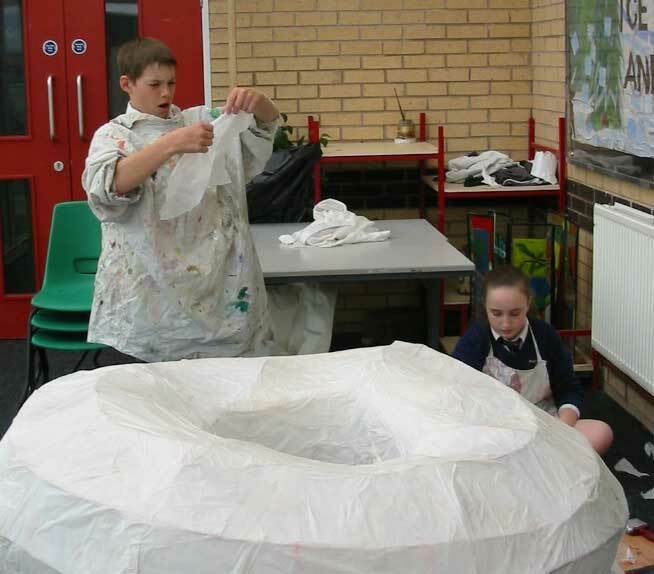 The puppets provide an excellent starting point for practical work, being hand-crafted by professional artists following traditional designs. 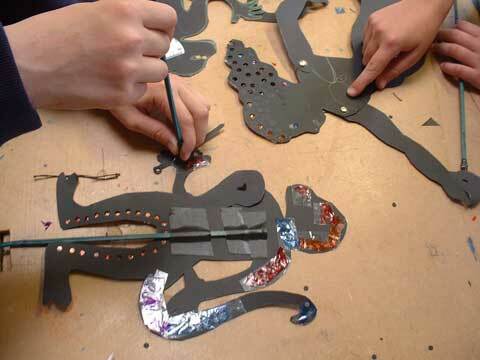 Students learn techniques to create their own performing puppet. They use and combine a variety of materials and processes. They work with shape, line, colour and pattern to create different effects. They are enabled to follow up with their own designs. Sharing in puppet play and creating short scenarios together, students can observe and compare each other’s work, seeing what does and doesn’t work. An ideal opportunity to develop work on cultural differences. “explore a range of religious stories and sacred writings and talk about their meanings” . . . . . . . . ‘The Ramayana’ was first told many thousands of years ago in India and it’s main characters ~ Rama, Sita, Lakshmana, Bharat, Hanuman are used as role models for the way people should live with each other and have influenced Hindu religion and society for many centuries. “The Ramayana is traditionally performed at Divali, the festival of light on a moonless night in November, a time when other cultures also celebrate light. 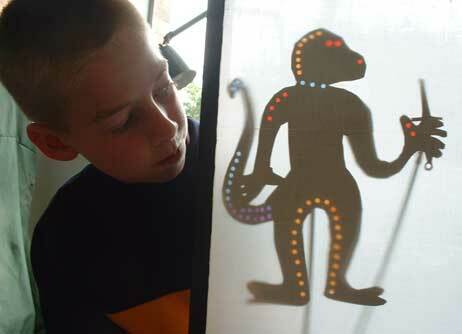 What better way to cover this topic than with a traditional shadow theatre performance. Throughout India ‘The Ramayana’ is performed by dancers, actors and puppeteers but particularly in the South, it is with shadow theatre that the tale is told and often the stage is erected opposite the temple as it is considered a sacred ritual performed for the Gods themselves. “story: how and why some stories are sacred and important in religion"
“celebrations: how and why celebrations are important in religion"
“symbols: how and why symbols express religious meaning"
“using art and design, music, dance and drama to develop their creative talents and imagination"
Diana has a depth of knowledge about the Indian culture and mythology, the desire to help make the culture more accessible and the resources to provide informative sessions. through the activity itself:- social interaction, inspiration to be motivated, taking responsibility, performing well, sharing in decisions and making choices, etc. through specific themes:- such as peace, bullying, anger, healthy living, risk-taking, empathy, respect, etc. By using the puppet as a visual metaphor, it represents real life but at the same time is one step removed from the real world. It is therefore useful in communicating sensitive issues. Making their own puppet gives a child a sense of ownership. 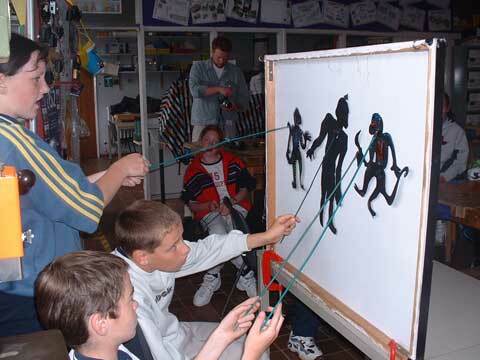 Through learning how to control a puppet following given techniques and exercises, a student gains better understanding and co-ordination. This in turn gives them greater confidence and the freedom not only to express themselves but also the possibility to communicate that expression by speaking through their puppet. The puppet becomes a tool for rich, creative expression. Collaboration, the ability to work as a team. Planning Skills and Execution (reward). Black Cat is happy to help plan sessions which include areas of the National Curriculum that you may be struggling to include into your lesson planning. 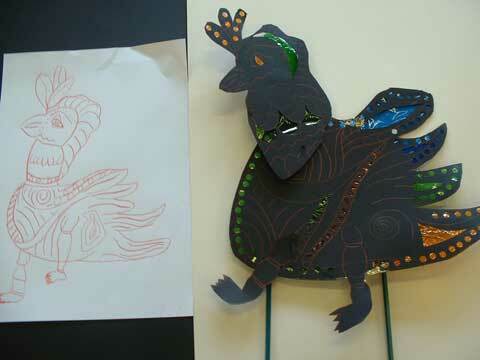 Students can study and handle beautiful hand-crafted puppets from another culture, see how they are made, the materials used, specific designs, exploring the reasons behind the designs, the purposes of the artefact, changing perceptions and uses. 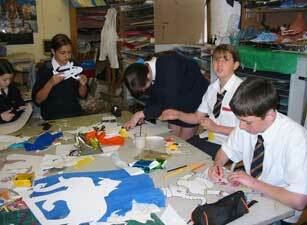 Then go on to design and make their own performing puppet. There is the possibility to work collaboratively. “Range and Content” specifically includes the study of puppetry. 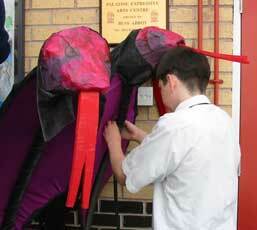 “Curriculum Opportunities” encourages links with other subjects, puppetry being specifically relevant to Drama. And of course, the Indian performances and workshops can also provide a rewarding, entertaining and creative activity for multi-cutural events.